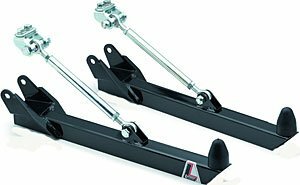 Lakewood Traction Bars are designed to fit most leaf springs. These bars strengthen rear suspension and reduce wheel-hop. They are constructed of heavy gauge rectangular steel tubing and feature MIG welded brackets for extra strength. These traction bars include rubber snubbers, U-bolts and installation hardware. If you have any questions about this product by Lakewood, contact us by completing and submitting the form below. If you are looking for a specif part number, please include it with your message.